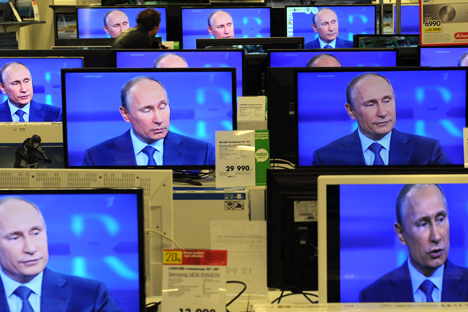 In a five-hour televised session, Vladimir Putin decries foreign interference in Russian domestic politics and gets tough with local critics. By the end of his annual televised Q&A show with ordinary Russians, aired live for five hours by the country’s two biggest national TV channels and three leading radio stations, President Vladimir Putin received more than 3 million questions. His international agenda focused on Russia’s relations with the West, notably with the United States. Putin underscored that Russia, itself a victim of international terrorism, has always called for strengthening cooperation on security with the United States. He touched upon the issue of sexual minorities’ rights, which was raised at his most recent top-level talks in Germany and the Netherlands. Twelve minutes of the show was taken up by a debate with former Finance Minister Alexei Kudrin, a longtime ally of Putin’s, who was fired by then-President Dmitry Medvedev in September 2011 after criticizing the government for high defense spending. Kudrin challenged Putin over the economy, pointing out that “domestic factors have had more influence on the Russian economy than global ones.” Putin had stressed that the recession in the European Union, Russia’s top trading partner, had been the cause of a slowdown in Russia’s economic growth. Both Putin and Kudrin agreed, however, that it was vitally important for Russia to get over its oil dependency. Later, Putin referred to “the shale gas revolution,” assuring his audience that Russia hadn’t missed it and that it has enough natural gas to pump. He pointed out that the cost of shale gas was still too high, and its production involves a high risk of environmental pollution. Putin went live as one of his fiercest critics and would-be presidential candidate, Alexei Navalny, stood trial in the city of Kirov, 900 kilometers to the east of Moscow. What’s behind the ‘nationalisation of the elite? Navalny, whose team of anti-corruption activists has exposed misappropriation of state funds worth $2 billion through government procurement monitoring, is being charged with embezzling $500,000 worth of timber while serving as an advisor to Nikita Belykh, the liberal governor of the Kirov Region, in 2009. Navalny has denied any wrongdoing, and has called the charges a political frame-up. “Those who fight corruption should be crystal clean themselves,” Putin said of Navalny, adding that he had urged Russia’s Investigative Committee and Prosecutor General’s Office to be as objective as possible in the Navalny case. Meanwhile in a court in Moscow, an independent election watchdog, Golos, was fined $10,000 for refusing to register as a “foreign agent.” Last year Putin signed a law obliging NGOs funded from abroad to register as “foreign agents,” which in the Russian language is equivalent to foreign spies. At another trial in Moscow on Thursday afternoon, leftist opposition activist Konstantin Lebedev was sentenced to two and a half years in jail on a plea bargain for allegedly plotting unrest at a mass anti-Putin rally on May 6 last year. Putin fielded a series of questions about a letter that the late Boris Berezovsky, who died in the UK in March apparently from suicide, allegedly wrote to him earlier this year. Putin added that Russian authorities had no information about any involvement of foreign secret services in Berezovsky’s death.